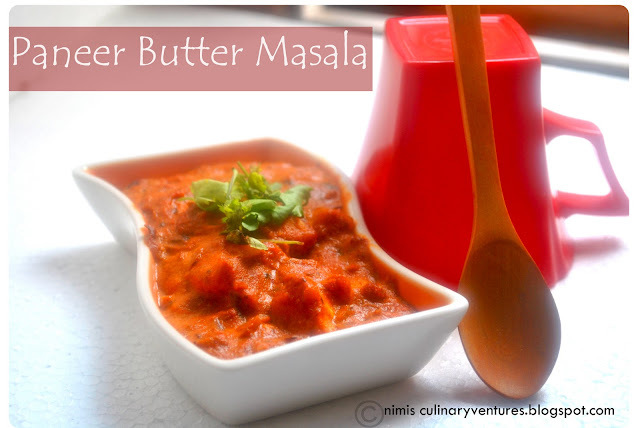 Paneer Butter Masala..to butter your senses! Boil the tomatoes with water and on cooling peel the skin of the tomatoes. In a mixer grind the tomatoes into fine paste. In a heavy bottomed pan pour butter and slightly fry and seperate the paneer cubes till golden. In the remaining butter saute the onions till brown.Now add in the ginger garlic paste and cashewnut paste and saute for a minute. When well sauted add in the tomato paste.When it starts simmering add in the chilli powder,garam masala and kasuri methi powder. When the flavour comes out and simmers well , add in the fresh cream. Switch off the flame and granish with freshly cut coriander leaves and butter.